Known for its distinctive Nantucket books, Egan Maritime Institute’s Mill Hill Press is the most prolific source of books related to the island and its maritime heritage. Mill Hill Press sells books on topics ranging from the island’s history, literature, art, and architecture to its traditions and relationship with the sea. 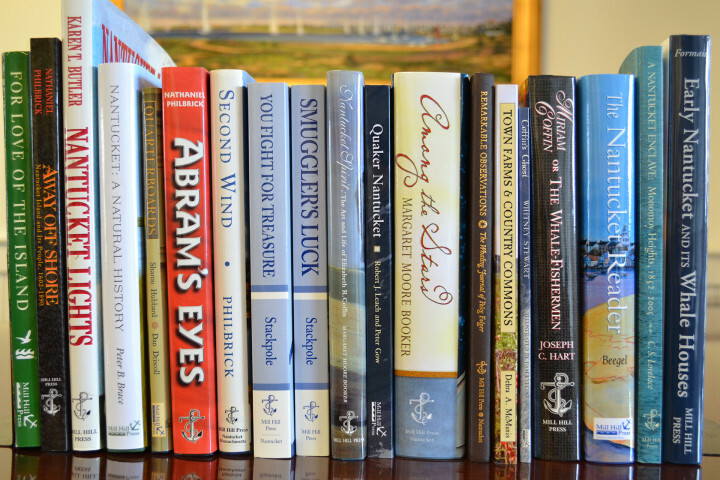 To purchase titles you may call Egan Maritime’s Adminstrative Office at (508) 228 - 2505; email egan@eganmaritime.org; or visit the Nantucket book sellers below. There has long been recognized a special relationship between a skipper and his (or her) boat. In this book Sanford, with nearly three quarters of a century of sailing beneath his keel, broadens that bond of affection and understanding to include the land and the sea in this tribute to the art of cruising the waters of Nantucket, his home port, in particular. 2015 hardcover $34.95. In the mere 6,000 years of their existence, the Nantucket islands have become home to a unique changing collection of living things, from the Muskeget Vole to deer ticks, the delicate Shadbush to precious Harbor Scallops. 2012. Reprinted 2013, and 2018 hardcover $35.95. Nantucket Island is fabled in song and story. Its 350 years of settlement have generated a wealth of fine writing about Nantucket in journals, ballads, and narratives Filled with adventure, humor, mystery, history, horror and inspiration, The Nantucket Reader is a must-have. 2008, Second printing 2009 hardcover $34.95. Quarterboards explores the tradition of naming Nantucket homes and adorning them with replicas evocative of name boards once found on sailing ships. Striking photography throughout captures the unique charm of Nantucket’s historic homes, bringing the deftly woven narrative filled with colorful characters and fascinating anecdotes to life. 2008, hardcover $39.95. This beautifully illustrated book recounts the fascinating history of Nantucket’s legendary lightships, its three lighthouses, and the people who worked to keep their lights shining brightly. 1997, hardcover $45.00. Peleg Folger, at age 17, sailed into Arctic waters in search of whales on Nantucket-based vessels as small as fifty feet in length. It is an absorbing human document by an extraordinary young man. 2006, hardcover $22.00. “Anyone with a feeling for Americana will appreciate the Williamsburg-by-the-sea quality of the book.” – New York Times Book Review. An in-depth study of the distinctive architecture of the island’s evolving whaling community. 1991. Second edition, Reprint hardcover $29.95. “A landmark achievement that shows how a young woman from Nantucket had a lasting impact on science, education, and women’s rights in America and the world.” – Nathaniel Philbrick, author of Away Off Shore, In the Heart of the Sea, and Mayflower. 2007, hardcover $59.95. Abram’s Eyes tells the little-known story of Nantucket’s Native American past. Generously illustrated, including a detailed map of the island’s Indian place-names, this book brings a fresh and instructive perspective to Nantucket’s history. 1998, hardcover $35.00. While sailors, whalers, and fishermen followed the vocations that made the island famous, other Nantuckers, beginning with Native Americans, grew the food that supported the population. 2010, hardcover $24.99. For more than a century, the forces that shaped Nantucket have resided in Monomoy Heights, as the island has evolved from a sleepy seaside community to a bustling summer resort and vacation destination. 2005, paper $30.00. Based on the original research in records long thought lost, Quaker Nantucket explores the spectacular growth of Quakerism on the island and its equally astonishing decline amidst the collapse of the whaling industry a century later. 1997, paper $14.95. This elegantly written and lavishly illustrated volume brings to life an extraordinary Nantucket artist. Elizabeth R. Coffin (1850-1930) preserved in her canvases the people, landscapes, and rural lifestyles that were fading from the island. 2001, hardcover $35.00. Written by former Nantucket Shipwreck & Lifesaving Museum director, Edouard A. Stackpole, Life Saving Nantucket documents the triumphs and tragedies of a hardy breed of islands who, as volunteers, manned the early Massachusetts Humane Society sites and risked their lives to save those in peril. 1972, hardcover $25. Based on the life of the Tory "she-merchant" Kezia Coffin, this reprint of the 1835 novel presents a detailed picture of the island of Nantucket when it was the whaling capital of the world. 1995, hardcover $19.95. In Coffin’s Ghost, two young off-islanders, Anna and Nat, come to Nantucket to visit Papa Henry, their grandfather. On-island, they begin a journey through the island’s maritime past in search of pirate treasure. 2009, paper $29.95. Originally published in 1931, Smuggler’s Luck recounts the adventures of a Nantucket boy, Timothy Pinkham, during the American Revolution. 2005, paper $20.00. Originally published in 1932, this book is the second of four in Stackpole’s series of adventure stories of Timothy Pinkham. 2006, paper $20.00.